Art on the Corner is a community-based nonprofit arts-ministry of  Lutheran Church of the Good Shepherd, located on the northwest corner of Fourth Avenue and Bay Ridge Parkway, where local, city-wide, and international artists have performed and shared their art with the communities of southwest Brooklyn for the past 13 years. Through Good Shepherd, Art on the Corner  provides a venue for artists to share their work with all ages in the community through its numerous programs: CONCERT SERIES, SLICE Family Night, JAZZ NITE, Drop-In Art Class for Kids, Saturday Art Classes for Children, Art/Wellness for Adults, Drumming for Women, and the soon-to-come Soul Café Gallery. 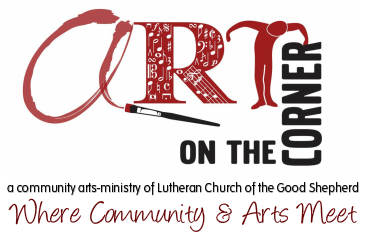 Art on the Corner also aims to make the arts accessible to the community and the community accessible to the artists by maintaining affordability and utilizing Good Shepherd's ADA compliant space. Driven by its mission as "a place of belonging," the faith community of Lutheran Church of the Good Shepherd in Bay Ridge, Brooklyn, sought to open its doors in welcome to its neighbors. Inspired by its beautiful sanctuary and its newly-renovated Soul Café next door as the perfect place for recitals, art displays, exhibits, events, and concerts, the idea of Art on the Corner was born. Supported by the people of Good Shepherd, the members of the Russia meets Brooklyn Meetup Group, and a few dedicated community-minded, artist advocates, Art on the Corner began offering excellent programming in 2005.